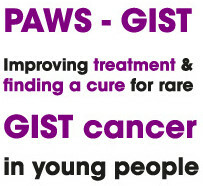 To be eligible for the PAWS-GIST clinic you will be someone who has been diagnosed with GIST in childhood/adolescence or who has been diagnosed with wild-type or a syndromic form of GIST as an adult. Your individual case will be examined by the most specialist team of experts in the UK. Having reviewed your individual circumstances you and your local oncologist will receive a report containing recommendations and a treatment plan tailored to your specific needs. Will the clinic benefit others? Collectively each individual patient who attends the clinic will assist in building our specialist team’s knowledge of PAWS-GIST. Through time the data that we collect will be used to undertake research to understand this disease in greater detail and will lead us to answers about what causes PAWS-GIST and eventually what can be done to cure it. What is the goal of the clinic? Our aim is to optimize treatment regimes for PAWS-GIST patients, provide treatment plans tailored to individual circumstances. We aim to be a catalyst for reaerch which will improve treatments and eventually find a cure. We plan to hold up to three clinics each year, using each one to bring together up to 8 patients who will meet with GIST specialists from a variety of disciplines. You will be with us for a day and will ideally join us the evening before for a welcome meal. There will be assistance with your travel and accommodation will be booked for you. Please see the dates for the next clinic. Who will pay for my visit to the clinic? Lodging & meals – Hotel accommodation for the night prior to the clinic and a Welcome meal involving all of the patients attending the clinic are organised and paid for by GIST Support UK's PAWS-GIST Fund..
Who are the PAWS-GIST Team? See our Specialist Team page. Where is the Addenbrooke's Clinic? See our Clinic Location page.